Anyway, back in the day it wasn't too hard to spot the fake fruit from the real. It would usually be cloudier in color; sometimes with a layer of something fuzzy molded to the top of it... probably in an attempt to make it look more authentic. But let's face it. It never looked quite right. For, it was fake fruit. And to be quite honest, I could never understand why someone would want to put out plastic fruit when real fruit was, well... real! However, the weird thing is, as a little girl, I still tried to eat that darn fruit. I would pluck a rubbery grape off it's plastic vine and chew it for hours like an idiot. Granted, I was a five year old blonde explosion who was still learning about the ways of life. But come on... why keep eating when you know it's plastic fruit? 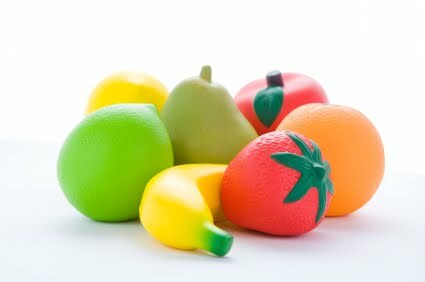 But today... ah, today you can buy plastic fruit that looks soooo real. You would never know it. Pottery Barn and the Crate-n-Barrel catalogs tout apples that mirror the exact likeness of a Granny Smith apple. If compared side-by-side, one would be hard pressed to tell the difference between the real and the fake because both visually look the same and are exact in weight and feel. Only until you bite into a mouth full of plastic do you tragically realize that the fruit is fake. (Not that I have done this. Ha ha.) YUCK! What once looked realistic enough to eat and enjoy has now chipped a tooth and left you with a bad taste in your mouth. I have found that many people are the same. They show up at church or Bible study and talk a great game. They fellowship and speak in authority and agreement about spreading the gospel to the world. They carry their Bible under their arm and look exactly like any other Christian out there. But unfortunately, they are as fake as the plastic fruit that once sat on my aunt's coffee table. For when the time comes to actually minister... to actually DO the work of the Lord... they disappear. When the moment to step up and speak out on behalf of Christ arrives, they zip up their lips and cower. Sure, they are comfortable in the midst of other believers because they love to socialize. And they full-heartedly appear to be on-board in helping to advance God's Kingdom. But in reality, they have never broken open their Bible in private study. They do not know how to navigate through scripture to share various truths about Jesus. They have never shared the gospel message to anyone (not even once). And although some of them have attended church there entire lives, they know very little about the Lord. These are the lukewarm. The unsaved "saved" folks who darken the doors of God's house each Sunday and lie through their teeth about holding a relationship with Jesus. These are the folks who fall under the radar because they are standing beside us as we worship. Now, like me, you may ask... How can you go to church your whole life and never share or know Jesus? How can you claim to be committed to serving God's kingdom, but never lift a finger to minister or help the poor, the widowed, or the orphaned of this world? Is that possible? Does that really happen? Well, let me share with you a little story. Chuck and I have no children. However, Chuck comes from a large family with four older sisters and many relatives. I also come from a large extended family filled with many cousins, and we all grew up living in close proximity to one another. Throughout both our lives, both Chuck and I have been blessed with many babies joining our large family. Both of us have bounced little cousins, nieces, nephews on our laps. Both of us have watched over, cared for, fed, burped, and loved each wonderful infant that has graced our family tree. But only one of us has ever changed a diaper. Yes, it's true. For forty-plus years, I, Victoria Anderson, hereby announce that I have never changed a dirty diaper... EVER! To know me, you would think I would have mastered this skill. With all my little cousins to cuddle and care for, you would think I would have HAD to take care of such business at one time or another. But alas, no. I always seemed to get out of it. Not intentionally, mind you. There just never was an occasion for me to step up as THE ONE to change someone's dirty diaper. Someone else would always offer to pick up the slack and take care of the responsibility... and I was never sorry to let them. So, I guess I could see how someone could appear to be something they are not. Too many churches are filled with masses of people who enjoy the goodness of God from a distance. They enjoy socializing and spending time with believers but don't actually subscribe to following Jesus in their hearts. These people are the plastic fruit that showcase themselves within the pews of our congregations. But the Spirit of Truth is not in them. They do not know or share the real love, joy, peace, patience, kindness, goodness, faithfulness of God. No, they would rather enjoy the "show" and take part in the fun of social fellowship. But Jesus... no, not interested. Most importantly, we must take time to minister to the lost... all lost... especially those that walk the corridors of our chapels. God took great care to warn believers against those who are false prophets... those who claim Christ, but do not follow Him. We are not to foolishly assume that everyone who holds the title "Christian" is automatically trustworthy. No, there must be real fruit. Many fake fruits have led well-intended believers off course - away from Jesus. We must remember that true followers of our King actually abide in Christ. They follow His way. They know His word. They yield to His life and produce. Let's be sure to ask God to keep our hearts on fire for His purpose and hold one another accountable to follow His way. Let's always speak up and minister on His behalf and encourage and motivate one another to do also. Let's ask our King to ripen us and make us delicious, holy fruit... REAL FRUIT! He is our Vine, ladies! May we make every effort to flower in His grace while standing against the thorns that He will one day remove forever!